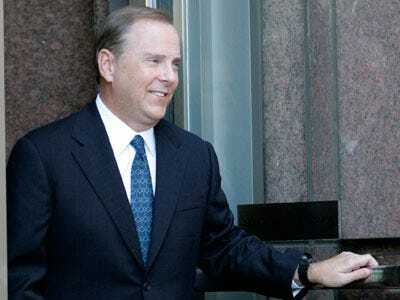 The reports coming out of Jeff Skilling’s hearing at the Supreme Court today indicate we all — including of course, the ex-Enron executive himself — will have to wait until at least late spring to know Skilling’s fate.The justices did not show an extreme amount of interest in hearing more about the “honest services” fraud claim, and instead focused on Skilling’s argument that his trial venue — Houston — was unfair. Which way they’ll lean, attendees said, is unclear. According to both SCOTUSblog’s Lyle Dennison and Mark Sherman of the AP, the justices did appear troubled by the potential taint of the Houston jury pool and by the relatively small amout of time (5 hours) the presiding federal judge, Sim Lake, allowed. That said, the Court will be hesitant to direct lower court’s too specifically on how to conduct voir dire. The relatively little attention the justices gave to Skilling’s attorneys’ argument that the “honest services” fraud law is unconstitutional can of course mean several things. First, the Court has already heard two honest services cases this term, so they could have already made up their minds about how they will rule, either providing a clear interpretation of the relevant statute or throwing it out altogether. Even if that’s true, however, we think if they were going to throw out Skilling’s convictions based on the unconstitutionality of the “honest services” fraud clause, they would have spent more time on the issue. The government argued in its briefing that, even if the clause is unconstitutionally vague, Skilling’s convictions could have rested on other grounds and that any error would be harmless. Dennison noted that Justice Breyer, in particular, indicated that the specifics of Skilling’s voir dire process would need to be examined. What does all of this mean? It looks like it will be a very fact-specific position that may not mean any sort of sweeping change in the way court’s address venue decisions. The decision, will, of course, very specifically impact Skilling. His best hope is that his convictions will be thrown out and he’ll be granted a new trial. Lyle Dennison’s full analysis, with additional quotes from the justices and arguing attorneys, is here.